Artistic Licence is celebrating a stunning performance at PLASA London 2013, having received massive interest in its newly-previewed and launched products, two of which were recognised in the Awards for Innovation. On the stand, visitors were clearly delighted by nanoScope, a pocket-sized DMX tester that looks set to become next year's 'must-have' item for technicians. With its intuitive colour-coded feedback and robust, lightweight casing, nanoScope offers a powerful combination of functionality, practicality and affordability. When it came to the Awards, however, it was eSense - a ground-breaking new system that enables dedicated RDM monitoring, storage and display - that won the judges over. In recognition of the product's ability to transform data management, the PLASA judges awarded eSense an Award for Innovation. Completing the accolades, Art-Osc - the new public domain, royalty-free protocol from Artistic Licence that enables remote interfacing of lighting control data via smartphones or tablets - also received an honourable mention. Artistic Licence CEO, Wayne Howell, sums up: "I think we were all unsure about what impact the move to Excel would have on the show, but from AL's perspective it has been a resounding success. We have already re-booked for next year, and hope others agree that PLASA London remains the premier international fixture in the trade show diary." 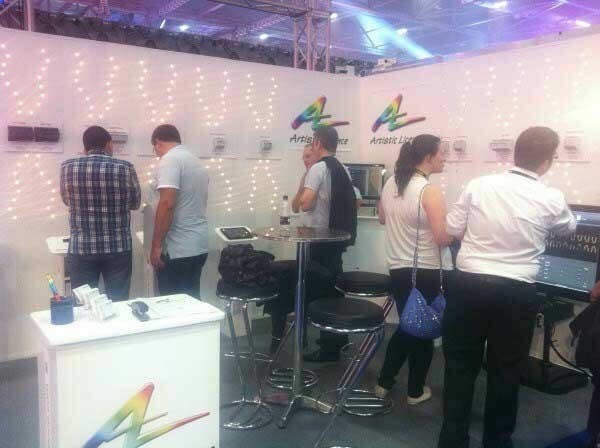 Artistic Licence is exhibiting at LuxLive 2013, 20-21 November, Earls Court. Stand B12.